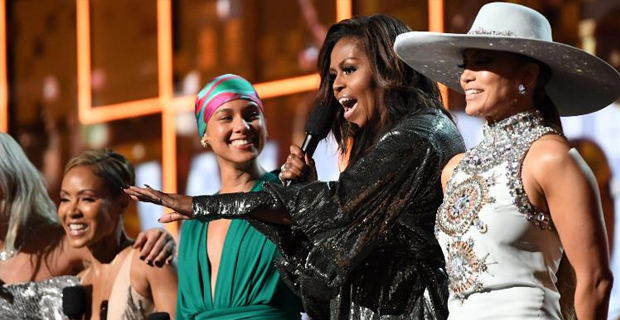 The Grammys are always full of surprises, but the crowd at the Staples Center were particularly taken back when none other than Michelle Obama took the stage. The former First Lady joined Lady Gaga, Jennifer Lopez, Jada Pinkett Smith and host Alicia Keys to discuss the power of music. Dolly Parton received a tribute fit for a country music queen at the Grammy Awards and the eight‑time Grammy winner was serenaded by her goddaughter, Miley Cyrus, Little Big Town, Katy Perry, Maren Morris and Kacey Musgraves. At the age of 85, country star Willie Nelson won best traditional pop vocal album for My Way and Quincy Jones was honoured in the best music film category, for the Netflix film Quincy. Meanwhile, Childish Gambino's "This Is America" has won the Grammy for song of the year, becoming the first rap song to win the prestigious award. Lady Gaga, Ariana Grande and Kendrick Lamar have won early Grammy awards in LA. Gaga also won best song written for visual media, for A Star Is Born track Shallow;as well as Best Pop Duo/Group Performance and best pop single for Joanne. Other early awards included The Greatest Showman, which won best soundtrack; and best music video, which went to Childish Gambino's This Is America. Dua Lipa won her first Grammy for the Silk City collaboration Electricity, which got best dance recording while fellow Brit Ella Mai also won an early trophy ‑ best R&B song for Boo'd Up.